I’ve always objected when leftists engage in moral preening about how they supposedly are more compassionate. Europeans statists, for instance, claim to be more compassionate because their governments have greater levels of coercive redistribution. But I ask them why they think it’s compassionate to give away other people’s money. Then I shame them by showing data on how Americans are far more generous in terms of trying to help others with their own money. I have the same debate in America. Take the issues of unemployment benefits. My leftist friends say that compassionate people should favor extended benefits. To which I reply by asking them why it’s good to pay people to not work and assert instead that genuine compassion should be defined by policies that enable people to find jobs and become self reliant. 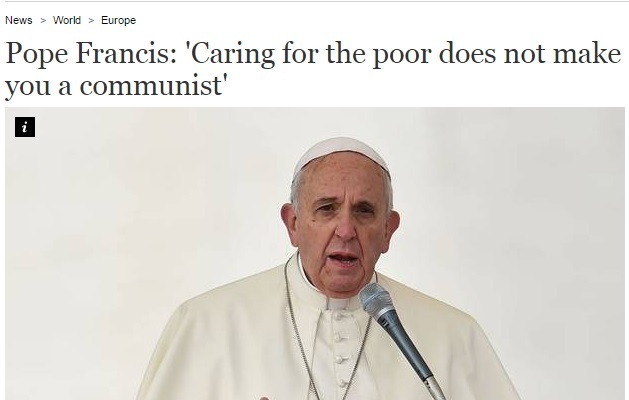 I raise this topic because the Pope recently made news by urging more compassion for the less fortunate, and he specifically said that raising the issue will lead some to think he’s a communist. Here are some excerpts from a news report in the U.K.-based Independent. Several people have asked my opinion about what the Pope said. My initial instinct was to be very critical. After all, various news reports interpreted the Pope’s statement as an attack on capitalism and an embrace of the welfare state. But since I know that the establishment media is biased and would want to portray the Pope’s comments as being supportive of statism, I didn’t want to make any unwarranted assumptions. So I tracked down a transcript of the speech. That’s the good news. The bad news is that it’s only available (at least as of this writing) in Portuguese, Spanish, Italian, and French. On the other hand, he doesn’t say that government shouldn’t be involved. And the tone of the speech certainly seems left wing, but that may simply be a result of me hearing a lot of statists making similar remarks and then calling for government-coerced redistribution policies. The bottom line, as I suggested above, is that the Pope may be wrong…or he may be right. Which seems inconsistent but accurate. After all, the Vatican sometimes has been very good on economic issues and at times very disappointing. But I will say something definitive. If anybody, including the Pope, thinks that bigger government is the way to help the poor, they are very misguided. I’ve already shared some powerful data to show that poverty was falling in America after World War II, but then the progress came to a halt once the federal government launched a “War on Poverty” and dramatically expanded the welfare state. Let’s augment that data today with a specific look at what happened when the federal government decided to “help” folks in Appalachia. Here are some excerpts from a very compelling National Review column. Appalachian whites suffer from many of the same social ills as working-class blacks: broken families, substance abuse, poor health, and high poverty. …Early anti-poverty efforts focused largely on the white population. …It was, as Ira Katznelson argued in an explosive book, a type of affirmative action — for white people. …Two federally chartered organizations — the Depression-era Tennessee Valley Authority (TVA) and Johnson’s Appalachian Regional Commission (ARC) — pumped millions of development dollars into predominantly white rural locales. …The aid came not just in the form of direct welfare payments, but also as government jobs. The country-music anthem “Song of the South” tells a familiar tale: “Papa got a job with the TVA; we bought a washing machine and then a Chevrolet.” …From 1965 until 1981, when the federal government began to scrutinize the cash flowing to Appalachia, federal appropriation to the ARC exceeded $1 billion (in today’s dollars) every single year. Even today, Congress sends about $80 million to the ARC; no other regionally focused entity spends more. As late as 2000, Appalachians received more federal money per capita than average, despite their minimal cost of living and the low number of federal employees in the region. So has all this federal largesse helped? …there are now precious few jobs in Tennessee valleys and too few drivers on those wide mountain roads. If Papa bought a washing machine and then a Chevrolet, Junior is buying oxy or meth: West Virginia leads the nation in drug-overdose deaths, with Kentucky third and Tennessee eighth. …Today, the inheritors of Katznelson’s affirmative action for whites occupy the lowest rungs of the socioeconomic ladder. West Virginia, Kentucky, northern Georgia, and South Carolina all nabbed more than their fair share of federal aid, but now they are among the poorest parts of the country. …Residents of these states suffer the worst consequences. In many Appalachian counties, inhabitants can expect to live only 67 years, more than a decade less than the average American. …Alongside the grim statistics is a spiritual poverty more difficult to measure but easier to see. There’s the high-school teacher who has only once had a class without a pregnant student. …Young students in eastern Kentucky sometimes tell their teachers that they hope to “draw” when they grow up. But they’re not talking about a career as an artist; they’re talking about drawing a government check. These kids weren’t programmed like that at birth; they were taught something destructive by their communities. There are some lessons to be learned. …the failure of the effort gives us ample reason to question the wisdom of federally led development efforts no matter the intended beneficiaries. Government cannot create a sustainable economy, no matter how hard it tries. And traditional welfare, while defensible as a way of alleviating immediate deprivation, too often fails to place people on the road to self-sufficiency. …encouraging family stability — or at least not discouraging it through the tax code or needless incarceration — promotes upward mobility more effectively than transfer payments…if the failures of Appalachia are any guide, a narrower policy agenda might actually serve the poor — white and black alike. Amen. If you want to help the poor, push for economic growth rather than redistribution. There are even some honest liberals who now admit that big government promotes long-run dependency. P.S. Since the first part of this post dealt with religion and compassion, it’s time to share Libertarian Jesus as well as the thoughts of Cal Thomas on whether Jesus was a socialist. P.P.S. Since the last part of this post dealt with Appalachia, I guess it’s appropriate to share this redneck joke. My brother has long made a similar argument. One symptom – or perhaps cause – of this is that the worst performing public high schools in the state are from west Louisville (predominantly black) and the southeastern counties of Kentucky (Appalachia). There are 2 takeaways: this isn’t a race issue; and government help doesn’t help.